Flowers small, lilac pink above (Hll), fading almost to white underneath; VII-VIII; foliage sometime plain green, some leaves pale yellow, others yellow underneath or yellow at tips, yellow colouring appears on sides of shoots but not in any regular manner but looking as if the shoots are "sun burnt". Leaves small, largest to 0.4cm long, less than 0.1cm across, with tightly recurved margins so that lower surface is not visible, with woolly hairs on upper side, without marginal cilia or with a few only towards tip. Hairs not glandular. Stems with short woolly hairs; habit low-growing, somewhat sprawling; height 10cm. Collected by Aidan Brady on Achill Island, Ireland, in August 1969, and since then cultivated at the National Botanic Gardens, Glasnevin, Dublin. Registered 7 November 1998: E. C. Nelson, Tippitiwitchet Cottage, Hall Road, Outwell, Wisbech, Cambridgeshire, PE14 8PE, England. 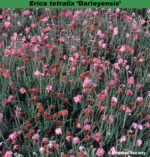 Flowers magenta; foliage green with gold tips in spring and early summer; habit erect. A sport on 'Con Underwood' found by John L. Jones, Glywern Nursery, Cilcennin, Lampeter, Dyfed, Wales, in 1993. VIII–IX; may be slightly more gold than 'Ruth's Gold' but hasn't come up to expectations'. 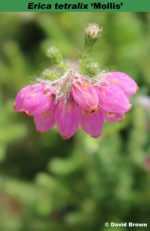 Wild-collected; found on Derry Cairngorm, Scotland, by James Mackay (Dellside, Blairdaff, Inverurie, Aberdeenshire) by 1995. Named after the mountain on which it was found and the foliage colour. Lilac-pink (H11) flowers, VIII–IX, very free-flowering; grey-green foliage; bushy erect habit; height 21–25cm; spread 31–45cm. 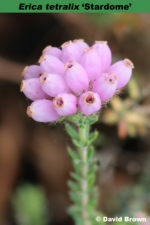 A beautiful heather. 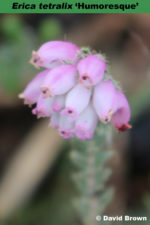 Wild-collected; found on Kampina Heath between Boxtel and Tilburg, Netherlands, by M. Zwijnenburg (Boskoop, Netherlands) in 1965; introduced by P.G. Zwijnenburg (Boskoop) in 1967. Named after the daughter of M. Zwijnenburg. Lilac-pink(H11) flowers, VIII–IX, very free-flowering; grey-green foliage flecked with gold; bushy erect habit; height 21–25cm; spread 31–45cm. A sport from 'Helma'. Pink flowers, VII–IX; yellow foliage; cushion-like; height 10–15cm; spread 26–30cm. Found by H. Buchtmann (Varel, Germany) in 1985. 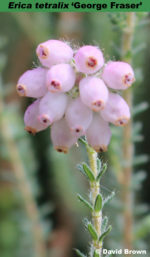 Pink (H8) flowers, VIII–IX; yellowish foliage in spring and summer, becoming lime-green with gold tips later; height 16–20cm; spread 26–30cm. Wild-collected; found on Goonhilly Downs, Lizard, Cornwall, England, by Mr & Mrs Jack Platt (Ulnes Walton, Lancashire) in 1977. Named after Mrs Ruth Platt. Flowers beautiful dark pink; foliage grey-green; height 25cm. 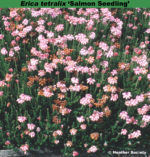 Found in 2004 by J. Baron as a seedling in his garden in Nieuw-Weerdinge, Netherlands. turves stacked two by two). Pale rose-pink (H7) flowers, VII–IX; yellow-green foliage deepening to rich yellow with reddish tips in winter; height 10–15cm; spread 26–30cm. This plant performs best in exposed, harsh conditions.